Crack two organic eggs into a bowl, whisk with a fork and set aside. Slice mushrooms and chop basil. Heat pan at medium heat and add butter. Add onion and sauté for a couple of minutes. Lay mushrooms flat and top with basil. Add eggs and cook for 2 minutes on each side. Serve warm. Yum! For the amateur chefs, this soup is labor intensive, but the taste is worth the work - make sure you have some wine to help with the process. For the coconut portion of the recipe, it may be best to buy a coconut from a juice place and have them cut up the coconut because it took me forever and I had to use a hammer. Seriously. The soup takes about two hours to prepare so give yourself some time. Serves 2 for dinner or 4 as an appetizer. Toss bok choy (or other green) with 3 tablespoons Bragg Liquid Aminos and 2 tablespoons sesame oil. Dehydrate at 115 degrees for 1 hour (I put in the oven at 250). 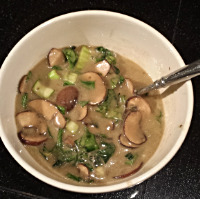 Toss mushrooms with remaining Bragg, sesame oil and coconut sugar. Let marinate for at least one hour. Place coconut flesh, coconut water and water in high-speed blender or heat pre-bough coconut water/mylk in a pot. Blend until the mixture starts to feel warm. Add cumin, turmeric, ginger, raw chili garlic sauce, salt and pepper. Blend until combined. Instructions: Squeeze all citrus with a small juicer (in photo above) or squeeze into a bowl and discard pulp and seeds by pouring over a cheese cloth or small strainer. Throw everything into a Vitamix or blender with the mint and blend for about a minute until smooth. Pour in a glass and enjoy! Instructions: Throw all ingredients (soft items first) into a Vitamix and set to the smoothie setting and it will turn off when it's finished. In a normal blender it's important to read the instructions to see what can be put in there as you don't want to ruin the blades. Pour in a glass and enjoy! I love burgers, but whenever I go to a restaurant I end up taking off the bun, adding avocado, swapping the fries for salad and then I've created a sub-par, $25-dollar burger. Forget the restaurant. Buy some ground beef (or turkey) or really any other meat or tofu you want and dress up the toppings with anything you like! Red leave lettuce, cut in half, lengthwise so you have the soft part as your "bun"
Preheat over to 400. Line baking pan with foil and place baking rack on top of it. Separate the meat into 4 and roll into patties. Place burgers on the pan and top with salt and pepper (and any other seasonings), flip and top other side. Put in the oven for 20-30 minutes (20 for rare and 30 for well). Flip once. Wash and cut lettuce and set aside. Dice all your veggies and toppings and set aside. Saute mushrooms for about two minutes in a little butter and set aside. Use the mushroom broth to fry the egg - I fry on a really low heat with a top so it creates a soft yolk. Set aside. 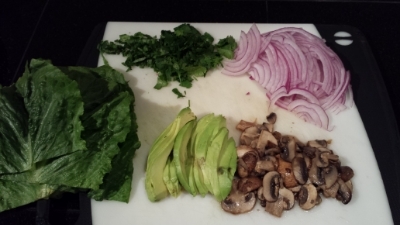 When burgers are done, place with your toppings in the lettuce wraps. Enjoy!